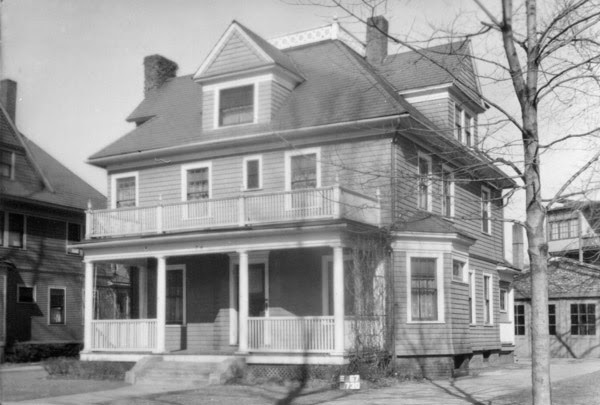 The house at 68 Washington Road in Springfield, around 1938-1939. Image courtesy of the Springfield Preservation Trust. 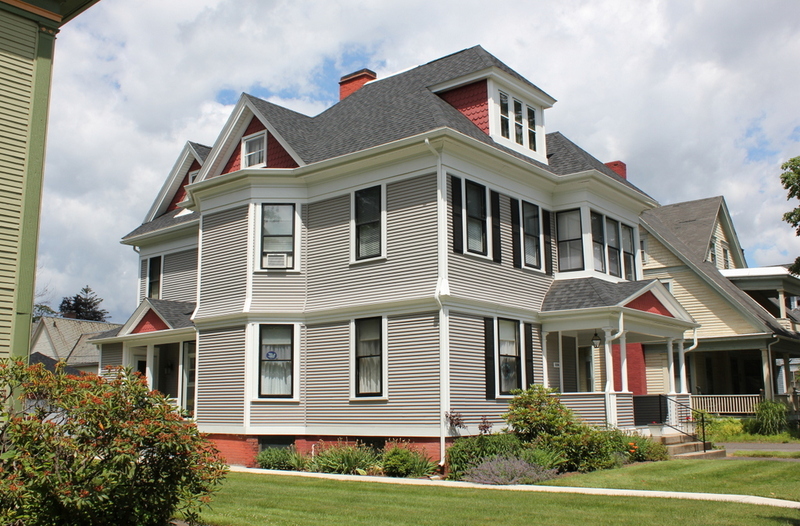 This house was built in 1910 as the home of Ernest D. Bugbee, the treasurer of the D. H. Brigham clothing company on Main Street. He was about 36 years old at the time, and had already lived in several different homes in the Forest Park neighborhood. Until about 1907 he lived in the house next door to the right, a 64 Washington Road. 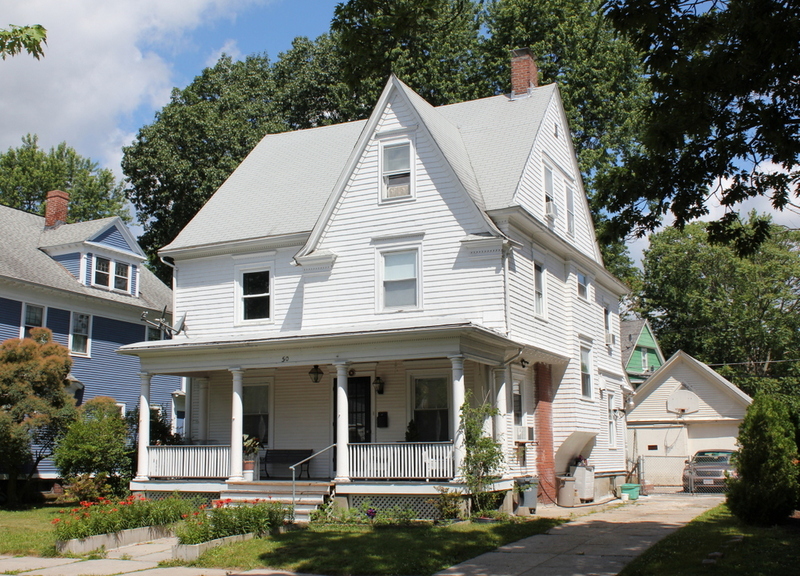 Then, from about 1908 to 1910 he lived at 116 Fort Pleasant Avenue, before returning to Washington Road and moving into this house around 1910. 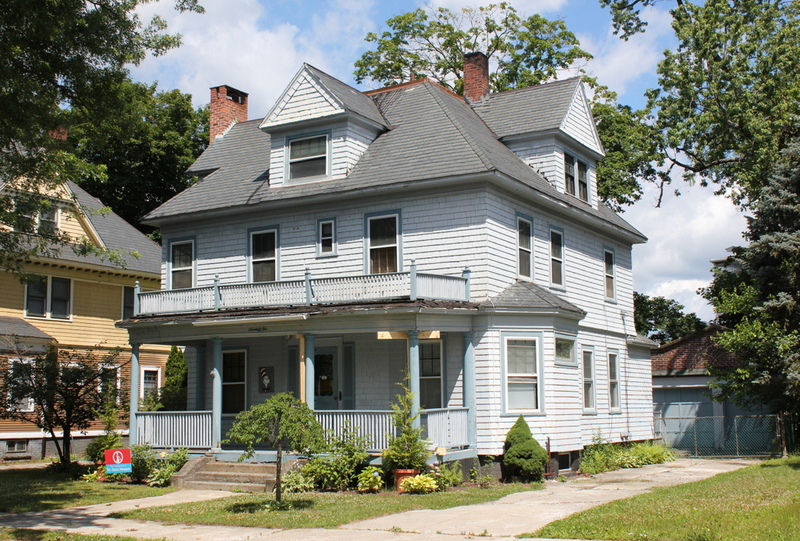 He was living here with his wife Maud and two servants during the 1910 census, but they did not remain here for very long, and by 1913 they were living in another newly-built house at 208 Longhill Street. This house on Washington Road was subsequently purchased by Harry L. Hawes, a businessman who owned a sporting goods store on Main Street. He and his wife Mary were both in their 40s at the time, and they continued to live here for many years. Harry died in January 1939, probably right around the same time that the first photo was taken. During the 1940 census, Mary was living here alone except for a servant, and she remained here until her death a decade later in 1950. Today, this elegant Colonial Revival-style home has hardly changed in the nearly 80 years since the first photo was taken. The second-floor shutters are gone, and there is a different design in the pediment above the front entrance, but overall the house has remained very well-preserved, and it is now part of the Forest Park Heights Historic District, which was added to the National Register of Historic Places in 1982. 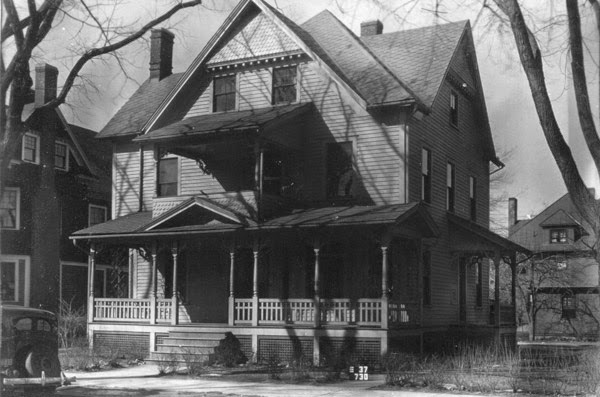 The house at 44 Washington Road in Springfield, around 1938-1939. Image courtesy of the Springfield Preservation Trust. 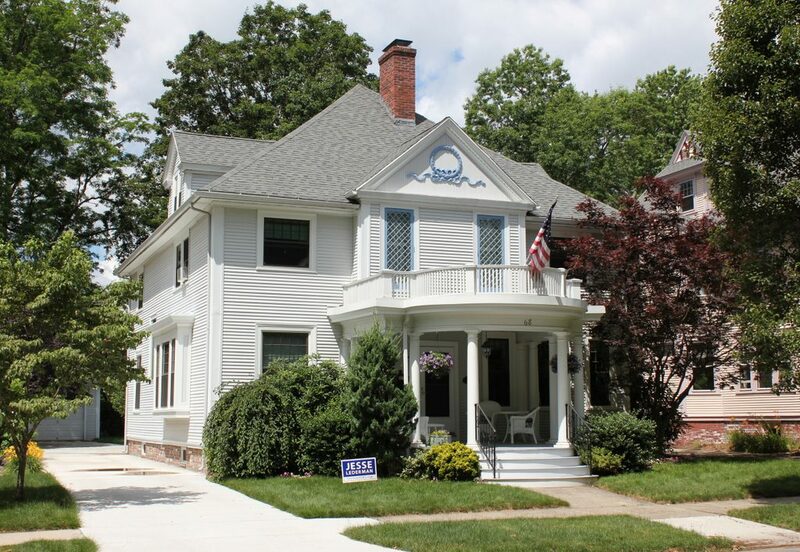 This house was built in 1901, and was originally the home of Jesse M. Marsh, the secretary and manager of the Commonwealth Securities Company. He lived here with his wife, who was, curiously enough, also named Jessie, and they lived here with their son Walter. During the 1910 census, they also lived here with Jessie’s widowed sister, M. Louise Dorsey, and her 26-year-old daughter, Agnes. However, around 1913 the family moved to Birmingham, Alabama, and this house was subsequently sold. The house was purchased in 1913 by Henry and Mary T. Beach. Mary died a few years later in 1918, but Henry was still living here during the 1920 census, along with his daughter Della, his son Philip, his sisters-in-law Anne Brosnan and Josephine Holian, and Josephine’s two sons, John and Bernard. Henry died in 1928, followed by Anne two years later, and by the 1930 census only Josephine and Bernard were still living in this house. They were paying $50 per month to rent the property, and 21-year-old Bernard was working as a clerk in a broker’s office at the time. By the time the first photo was taken, the house was being rented by Edward S. Chase, an insurance agent for the Massachusetts Mutual Life Insurance Company. He and his wife Dora were both in their mid-50s at the time, and they lived here with their son Phillip, Edward’s mother Emma, and a lodger. They remained here into the 1940s, and Emma died in 1943, but about a year later they left and moved into a house on Claremont Street in Springfield. Since then, the exterior appearance of the house has remained essentially unchanged, and it is now part of the Forest Park Heights Historic District on the National Register of Historic Places. 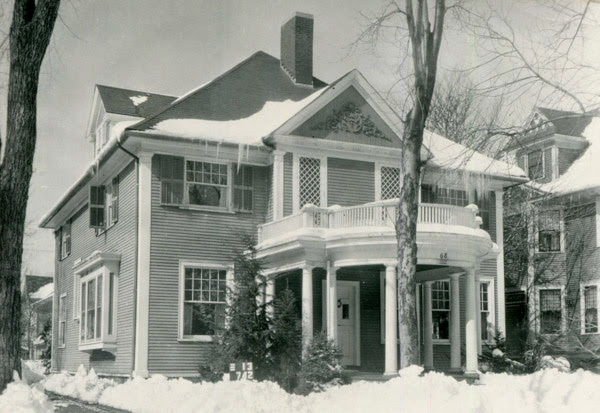 The house at 20 Greenleaf Street in Springfield, around 1938-1939. Image courtesy of the Springfield Preservation Trust. 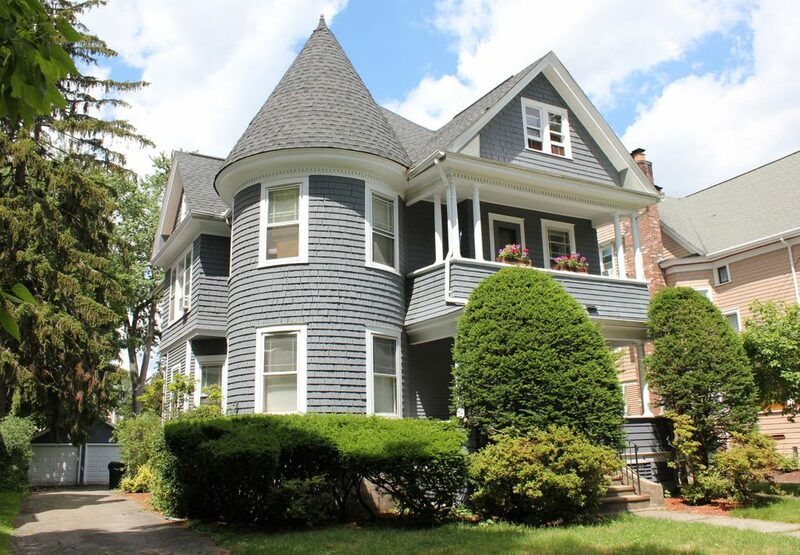 This house was built in 1893, and was originally the home of Francis R. Richmond, a prominent local architect. He was born in Shelburne Falls, but he later came to Springfield, where he began his architectural career with the firm of Gardner & Gardner. He later partnered with B. Hammett Seabury to form Richmond & Seabury, and their firm’s works in the 1880s included the Tapley School, the Jefferson Avenue School, and the chapel and gate for Oak Grove Cemetery. However, in 1890 they dissolved the partnership, and Richmond went into business for himself. Over the next 17 years, he designed buildings such as the South Main Street School, the North Main Street Fire Station, the Memorial Church Parish House, and several downtown commercial blocks, including the Homestead Building on Worthington Street. Francis and his wife Laura had six children, although two died young, before the family moved into this house. The other four children were still living here during the 1900 census, with 20-year-old Mabel working as a schoolteacher, while 18-year-old Alice was a milliner. The two youngest, Florence and Otis, were 13 and 12, respectively, and both were attending school at the time. Francis died seven years later, from what his death certificate listed as “chronic melancholia & chronic gastritis,” but the rest of the family, plus Alice’s husband George Allen, were still living here in this house during the 1910 census. The house would remain in the Richmond family until Laura’s death in 1919, and by the following year it was owned by Erving R. Gurney, the chief engineer for the Springfield-based Knox Motor Company. He and his wife Edith were both in their early 40s at the time, and had six children children who were in their teens and early 20s: Georgianna, William, Dorothy, Marguerite, Alice, and Edith. They lived here for several years, but by 1924 they had moved to New York. The house was subsequently sold to William J. Warner, who was living here by about 1925 along with his wife Minnie and their children, Janet and Allen. At the time, he was the sales manager of the Hampden Glazed Card and Paper Company, but in the late 1920s he became the vice president of the Marvellum Company in Holyoke. Then, in 1931, this company established the Beveridge-Marvellum Company, with Warner as president and general manager. 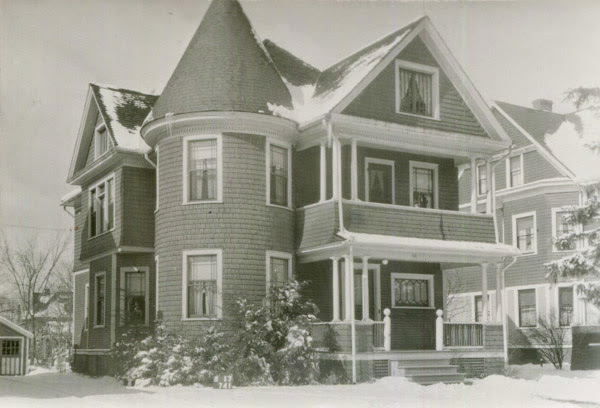 He continued to live here until as late as 1936, but by 1937 the family had moved to a house on Bellevue Avenue, in the northern section of the Forest Park Heights neighborhood. By the time the first photo was taken in the late 1930s, the house was owned by Homer R. Feltham, the head of the real estate department for the Springfield Safe Deposit and Trust Company. During the 1940 census, he was earning $4,200 for his yearly salary – a considerable sum at the time – and he lived here with his wife Mildred, their daughters Barbara and Virginia, and his father, William H. Feltham, who owned the William H. Feltham & Son real estate and insurance business. Homer later became the vice president and mortgage officer of the Springfield Institution for Savings, and he and Mildred lived in this house until they sold the property in 1957. Since then, the house has undergone some exterior changes. The second-floor porch has been enclosed, and many of the Queen Anne-style architectural details are gone, including the scalloped shingles on the second floor, the balustrade on the left side, the dentils above the first and second floors, and the balustrade on the third floor. Overall, though, the house has been well-maintained, and it is now part of the Forest Park Heights Historic District, which was added to the National Register of Historic Places in 1982. 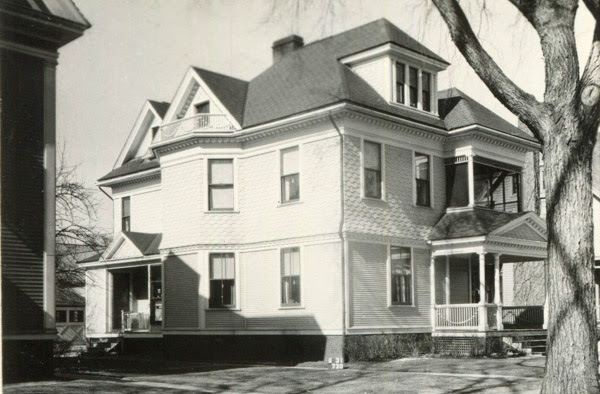 The house at 90 Garfield Street in Springfield, around 1938-1939. Image courtesy of the Springfield Preservation Trust. 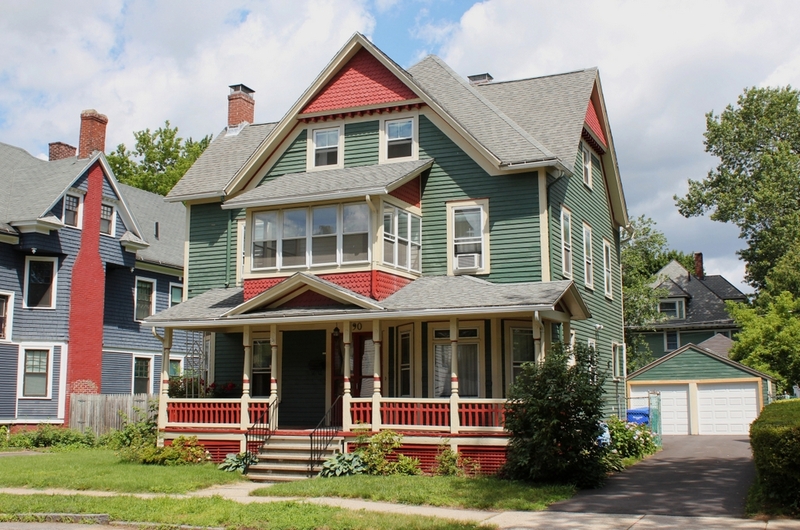 This house was built in 1893, and is among the oldest of the homes in the Forest Park neighborhood, which was developed around the turn of the 20th century as an upscale suburb just to the south of downtown Springfield. It was originally owned by Charles W. Rannenberg, a traveling salesman who lived here with his wife Caroline and their two children, Gertrude and Karl. Gertrude died in 1905, at the age of 22, from diabetes, but the rest of the family continued to live in this house for many years. Karl married his wife Pauline in 1917, and they lived here with his parents and raised four children of their own: Norma, Karl, Paul, and Arlene. Karl’s mother Caroline died in the 1920s, and Charles died in 1936, only a few years before the first photo was taken, but the rest of the family was still living here as late as 1939, along with Pauline’s mother, Lillie Beaune. However, by the 1940 census they had moved across the street and were renting the house at 77 Garfield Street. They would later purchase that house, and lived there until their deaths in the late 1960s. Nearly 80 years after the first photo was taken, this house has remained well-preserved, with only a few minor changes. The small porch on the right side is gone, the second-floor porch is now enclosed, and the chimneys have been altered, but otherwise the house retains its original Queen Anne-style appearance. Along with the rest of the neighborhood, this house is now part of the Forest Park Heights Historic District, which was added to the National Register of Historic Places in 1982. 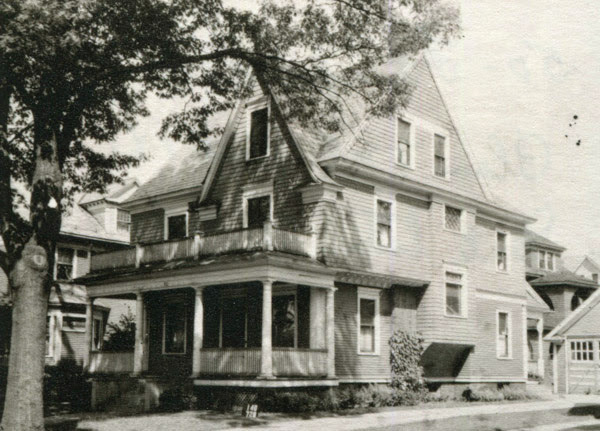 The house at 50 Fairfield Street in Springfield, around 1938-1939. Image courtesy of the Springfield Preservation Trust. This house was built in 1902, and according to the state MACRIS database it was originally owned by a Charles Seymour. There is no record in the city directories of a Charles Seymour living here, but the house may have been used as a rental property, because it had a number of different residents during the first decade of the 20th century. In an eight year span from 1903 to 1910, city directories showed a new tenant almost every year, and included a variety of middle class professionals. Starting in 1903, the residents included traveling salesman Douglas Clarke, dentist Walter S. Moody, C. B. Wire Works salesman William H. Miller, city board of assessors chairman George B. Smith, American Express route agent Herbert F. Millard, Faith Congregational Church pastor Frank W. Merrick, and finally, in 1910, Metropolitan Life insurance Company agent William F. Manning. Aside from Manning, who would go on to live here for many years, all of these men lived here for just a year or two before moving elsewhere. William Manning purchased this house around 1909, when he was about 42 years old. Originally from Ireland, he came to the United States as a teenager in the 1880s and subsequently married his wife, Annie, in 1889. By the time they moved into this house they had four children: Frederick, William, Jr., Evelyn, and Everett. The children ranged in age from one to 20, and the oldest, Frederick, worked as a machinist in a machine shop during the 1910 census. By the 1920 census the two oldest children had moved out, but Evelyn and Everett were still living here with their parents as late as the 1930 census. William died later in 1930, but Anna was still living here in the house when the first photo was taken in the late 1930s. Her younger children had moved out at this point, but William, Jr. had returned home and was living here with Anna and was working as a dentist. They would continue to live here until around 1950, but by the 1951 city directory Anna had moved to Boston and William to East Longmeadow. Nearly 80 years after the first photo was taken, the house has not significantly changed, with the most noticeable difference being the loss of the balustrade above the front porch. Although they served no functional purpose, these decorative balustrades were common design elements on early 20th century Forest Park homes, but most have since been lost. Overall, though, the exterior remains well-preserved, and the house is now part of the Forest Park Heights Historic District on the National Register of Historic Places.